Michelle Obama and other celebrities held up signs that read #BringBackOurGirls and set off a social media firestorm. For a long time Western media wasn’t reporting on the atrocities that Boko Haram were perpetrating on their own people. 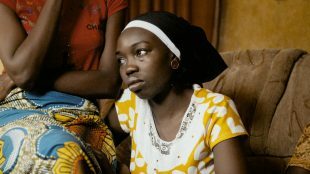 When the kidnapping of the Chibok girls came to the attention of producers Karen Edwards and Sasha Achilli, they knew they were going to make a documentary film about these brave young women. Since both Karen and Sasha had contacts in Northern Nigeria and were known to make films about “dismal places in the world focusing on women,” they found getting access to the Chibok girls easy. The bigger challenge was getting the Nigerian government to allow the Chibok girls to share the story of what actually happened to them. Once Karen and Sasha thousands of women were being kidnapped by Boko Haram, they realized they also had to talk to the “forgotten girls” to get the whole story. What some people don’t seem to understand about Boko Haram is that they’re causing a migration crisis in the country as people try escape them. In addition, many families are losing men, women and children to senseless murder at the hands of the militant Islamic group. Sometimes when Boko Haram shows up to steal a girl or young woman, the girl’s entire family is killed for resisting. Sometimes Boko Haram forces the women they’ve kidnapped to recruit more young women or wear suicides bombs when they target the military or civilians.Â Not only young women constantly trying to escape after they’ve been kidnapped, but so are young boys and men who’ve been forcefully recruited to the cause. Because most of the West doesn’t know this story, Karen and Sasha felt the urgent need to share it. Below, I talk to them exclusively about gaining the Chibok girls’ trust, how they found some of the ‘”forgotten girls,” and what they hope people will take away from the film. TV GOODNESS: One thing that you make very clear is that the Nigerian government had such tight control over the Chibok girls — what they were saying to you, what they could talk to you about. How did it come about that you were able to get them to share the diaries with you? Karen Edwards: â€œThey volunteered them. As you can see in the film, the government does want to control the narrative, even how their stories are told now. The Chibok girls, because they are so famous around the world, people are interested in what’s happened to them. They were held for 3 years. So the government made it clear for us going in, and made it clear to the girls as soon as we did arrive, what theyâ€™re not allowed to do; itâ€™s about what they had to do in the Sambisa forest. And that continued throughout the filming when we were with the Chibok girls. We didn’t really have much time where they were able to speak freely, where we were on our own with them. Gemma Atwal, the director, went into the safe house and was with the girls. She said it was incredibly controlling. If they ever thought she was on her own speaking to the girls and made to think about what happened to them, she was quickly interrupted and a minder would step in. TV GOODNESS: I agree. And then in addition to the Chibok girls, you also talk to a couple of “forgotten girls,” Zahra and Habiba. Their stories are so harrowing. How did you find those girls and get them to trust you enough to talk to you? Sasha Achilli: â€œTheir stories are extraordinary, but actually theyâ€™re quite familiar. When you speak to a lot of girls, a lot of the narratives are similar — different levels of violence — but they’re very similar. So I went in initially with the Neem Foundation, which is a Nigerian grassroots organization that provides ecological support in Maiduguri. They work in the host community and in some of the refugee camps. We also worked with a local journalist and producer who lives in a Maiduguri, who’s an amazing journalist. 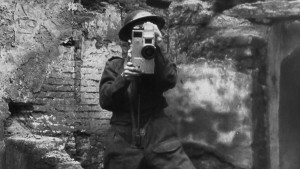 He lives that and had been covering the story for so long and had previously met a lot of women and spoken to them. So through the Neem Foundation and through him, we finally met Zahra and Habiba. They were willing and open to tell their stories. By the time we met them, they’d been out of the forest for over a year and a half, so they had more time to process what had happened. But we had to be really careful. Despite the fact that they wanted to tell us their story, they didn’t want their neighbors and people around them to know they were girls who had come from the forest because of the stigma attached to girls who escape from Boko Haram. TV GOODNESS: I also appreciate that in addition to telling the stories of the girls, you tell the stories of some of the men and boys, specifically Habiba’s two boys. Their story was so incredibly powerful as well. Why did you decide to include them in your film? Achilli: â€œWhat was incredible about Habibaâ€™s story was partially the fact that she rescued these two boys. The film focuses on women, but the crisis is so big and there’s a huge number of boys and men who have disappeared, been kidnapped or killed as well. Maiduguri has a massive population of female refugees, without their sons or their husbands. Edwards: â€œThe boys’ story helped to understand just how extraordinary Habiba is and, indeed, thatâ€™s so many of the women we met out there. Theyâ€™ve experienced terrible things, but still find courage to help others. There is a huge amount of suspicion in Maiduguri of neighbors and who you can trust and who you canâ€™t. So even in such a hostile and volatile environment, there’s a willingness to help their neighbors. TV GOODNESS: Thank you for including them. Once people have watched the film and learned the details of all these stories, what do you want them to take away from it? Edwards:” A lot of people have heard of the #BringBackOurGirls campaign, so they’ll be familiar with it. We wanted them to realize that the Chibok girls were just one in a thousand and that this is going on in Nigeria. The reason why the #BringBackOurGirls campaign was so powerful was the moment Michelle Obama held that card out, and when celebrities did. It just goes to show that, at least, if we want to put pressure on countries like Nigeria, they do care what we think and they do care about what the West think of them. But also, it’s just to show a difference between the Chibok girls and the ‘forgotten girls.’ As filmmakers all we ever do is pose questions in people’s minds, so they come away having learned something, but also really curious. 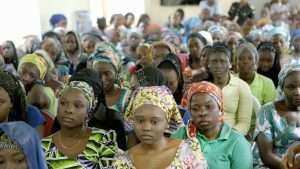 How do people feel about the Chibok girls? They are now living a quite privileged life in Nigerian terms. They have their education, they don’t want for food, they have their own maid and dresses made for them, but they’re not free to speak about what happened to them. Whereas the forgotten girls are free to speak if they so wish, but they don’t feel safe and theyâ€™re not secure. Stolen Daughters: Kidnapped by Boko Haram is airing now on HBO and available on HBO GO. I want to send money to Habiba from the HBO documentary Stolen Daughters. Do you know how I can do that? That is such a great question! Let me find out and I’ll email you. And thank you for caring enough to want to do something for these young women. I would also like to know how I might be able to send money to Habiba. I’ve emailed some people and I’ll email you directly when I hear back. Thank you! Yes, I also want to send funds to assist Habiba and her sons. I am also interested in finding about the welfare of Habiba and her 2 sons Umar and Ahmed. How can I get in touch with them to help?